The wide format Oki C830dn is a colour laser printer with a compact design ideal for small offices or workgroups with high-volume printing needs. Users can expect vibrant coloured images and solid black text documents from this reliable unit. The Oki C830dn colour printer has a maximum print resolution of 1,200 x 600 dpi. It can deliver 75,000 pages per month and it is equipped with standard duplexer. 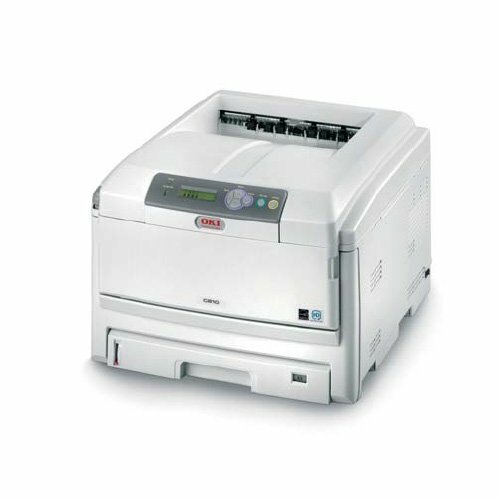 The Oki C830dn LED laser printer has a 256 MB memory that can be expanded to 768 MB. Disappointingly, Wi-Fi is not offered. This cube-like printer has an output tray and a small control panel with a monochrome LCD display and function buttons. USB and Ethernet ports are provided. The Oki C830dn duplex network printer can handle a total of 1,460 sheets. This unit measures 19.1 x 22.8 x 13.6 inches and weighs 79.2 lbs. Print speed is reasonable at 32 ppm for monochrome and 30 ppm for coloured. This robust workhorse delivers consistent output and requires little maintenance. Designed for sharing, the Oki C830dn A3 colour laser printer has built-in Ethernet. The C830dn laser printer also comes with an automatic duplexer to help reduce paper waste and it has versatile media handling. Oki C830dn toner cartridges are reasonably priced considering that each colour will print for approximately 8,000 pages before a replacement is required. The Oki C830dn printer does not have Wi-Fi. The addition of a front panel USB port to allow direct printing from thumb drives could have made it more useful. Print speed is acceptable, but the Oki C-830dn may not be suitable for larger businesses with more demanding requirements.